Combining environmental education with cycling helps children make sustainable mobility a life long decision. Photo by Nasos Efstathiadis/Flickr. Today’s children are inheriting an environmental crisis – a simultaneous combination of depleting resources and increasing pollution. Intelligent Energy Europe (IEE), launched in 2003 by the European Commission, seeks to find sustainability initiatives around the region that can help Europe’s citizens gain the knowledge and skills they need to surmount current environmental challenges and work towards creating a more sustainable future. 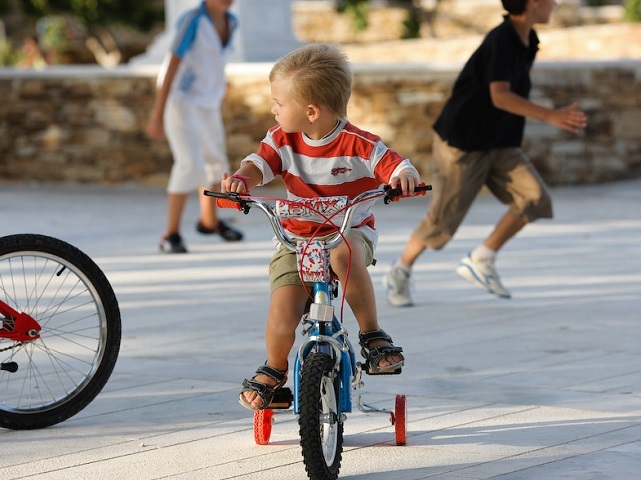 IEE’s Cycle-to-school project, an initiative of the Sustainable Travel Accreditation and Recognition for Schools (STARS), is an innovative program that works to increase sustainable mobility by changing the behavior of schoolchildren – and in turn the next generation’s mindset towards sustainability. The program has the simple aim of getting kids to cycle to school instead of being driven by their parents, but its implications are vast. In addressing children’s health, pollution, traffic congestion and road safety, cycling to school creates a model of sustainable education that can be used around the globe, and one that can have immense positive consequences for the future. The three-year STARS project is designed for youth ranging from primary school to teenagers. Although still in its first year, the program utilizes a general model of education and activity in a way that can be tailored to the ages and cultural backgrounds of the participants. Schools from nine European cities – Bielefeld, Brussels, Budapest, Edinburgh, London Borough of Hackney, Krakow, Madrid, Milan, and Noord Brabant – are already on board, and the program is moving towards its goal of creating a 5% modal shift from car-to-bike in participating schools. A key component in bringing together cycling and education is community collaboration. From the beginning, teachers, parents, school administrators, and cycling experts must discuss the factors inhibiting kids from cycling to school. Then, they can identify ways to facilitate change with community buy-in. Another key to successful cycling and education initiatives is to understand the unique potentials and constraints of a specific region, and change the general model to suit the region’s individual needs. Sometimes this means making small adjustments to areas with histories of cycling; at other times, more extensive measures are necessary. Cycle-to-school projects have the ability to encourage positive mindsets towards cycling, as well as motivate communities to do the hard work of changing infrastructure to better suit cyclists of all ages. The STARS program builds on research from mobility experts Mobiel 21 and draws on successful projects from across Europe, like Ride2School in Rotterdam and the Youth Travel Ambassador pilot program in London, to create a flexible and adaptable model. For primary schools, the STARS Accreditation Program allows kids and schools to gain bronze, silver or gold certification in recognition of achievements in using sustainable alternatives to cars. To address older kids’ motivations to cycle, the STARS Youth Travel Ambassador Scheme (YTAS) was developed, where groups of students take responsibility for designing and implementing campaign activities that will encourage their peers to cycle more. This means that students are simultaneously learning sustainable behaviors themselves, as well as learning to take the initiative to help others make positive changes. STARS is one of many emerging programs across Europe that combines physical activities, education, and community together in innovative ways. The Comenius Project brings together small teams of students from different countries to learn more about different biking cultures, as well as how to build a stronger biking community in their homeland. Other programs, like the British Schools Cycling Association, focuses on creating peer groups within communities for after school activities. Many models have arisen to serve the unique infrastructure and culture of each community and each child. The STARS Cycle Challenge is a two-day event with over 900 participants which serves as the pinnacle to the program. Every year, teenagers can compete and collaborate with other schools and regions to see who can cycle the most. The result is a disparate range of young people all connected through the competition, and all making cycling a part of their social world. This unique cycle-to-school program is growing quickly, with partners Mobiel 21 and GEA21 developing training materials to help new cities and schools to implement the program around Europe, and one day, the rest of the world. However, STARS can also take inspiration from the world at large as combined education-and-activity programs emerge around the globe. There are Brazil’s “Cycling Schools,” which combines cycling classes with larger community involvement programs. In Beijing, TEDx events are used to simultaneously teach students about the environmental benefits of biking – and rebrand it as “cool.” Maharashtra, India – home province to growing cities Mumbai, Pune, and Surat – combines its cycling program with a dedication to equality, and views providing bicycles and cycling classes as pivotal components in increasing girls’ access to education and opportunity. All of these models can learn from each other, and each can grow from the others’ success, so that all students across the globe will view bicycling as a vehicle for community, equality, and sustainable mobility, and an important component in their lives.